A large original oil on canvas by Pauline Glass who was educated on the continent at the Academy Julien and who exhibited throughout her career. A very colourful and vibrant painting depicting lilies in a vase on a table. 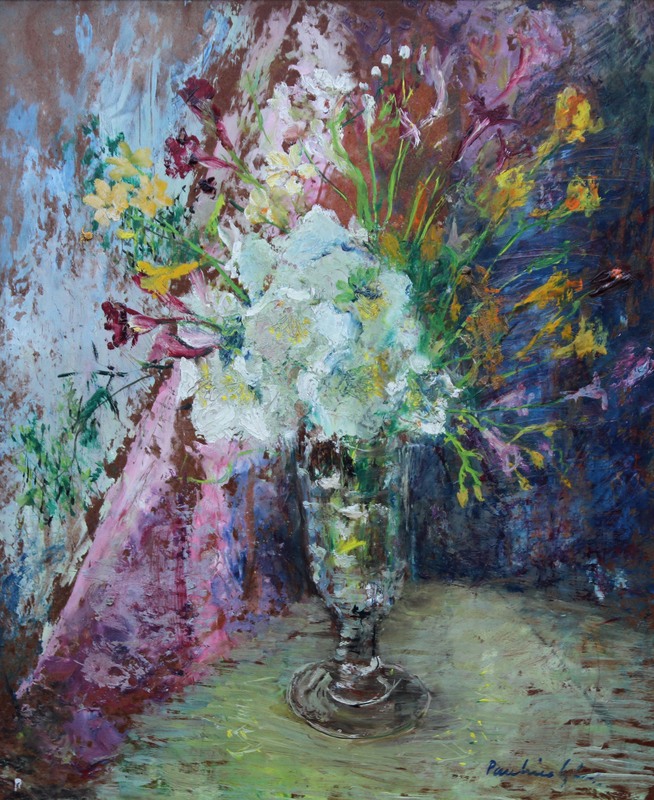 This stunning oil is a bold, adventurous and confident still life floral bouquet by a very talented British listed artist. Comparisons with the fluidity and influence of Matisse are not far away and this is an expressive delight. Painted circa 1950 and in fine gallery condition. Midlands and family estate. Remains of exhibition labels verso. Gallery frame in excellent condition. 30 inches by 26 inches. Pauline Glass (1908-1992) - Birmingham born artist who studied at the world famous Juliens Art Academy, Brussels, Belgium and at at the Birmingham College of Art. She was a member of the RBS and exhibited throughout her life including at the Society of Women Artists, The Royal Academy and at the prestigious New England Art Club. She lived and worked in the Birmingham area all her life.